Today is Dr. Seuss' birthday and Suessational Celebration NEA's Read Across America Day! The theme for this year, Read Across America celebration is green(Read with the Trees). NEA(National Education Association) has chosen the Lorax book as well as NBC/Universal's The Lorax movie for the campaign, more information found here. Universal Pictures is releasing the movie version of Dr. Seuss' The Lorax today. I hope the movie will deliver the good message of protecting trees to the kids. 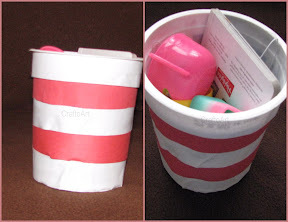 We made a Cat in the Hat craft from a yogurt cup to go along with the theme of Go Green! We(CJ and I) had a discussion about recycling and re-purposing. Striped Cat Hat ready to wear! CJ loves her new Hat especially that she can store lot of small stuff inside her hat like The Cat in the Hat knows a lot about that. Put small/soft stuffs inside the hat and wear it! Fold a poster board for the cover page of the book. Staple few sheets of paper together and Attach the papers to the inside of the cover page. This is such a great way to upcycle!